With just over a week to go until Christmas, the Food Safety Information Council today issued its Christmas food safety tips and especially warned consumers about the food poisoning risk of transporting food during the hot holiday season. Dr Michael Eyles, Council Chair, says once food is out of the fridge food poisoning bacteria can grow quickly in the temperature danger zone of 5°C to 60°C leaving us at risk of becoming one of the 5.4 million cases of food poisoning estimated each year in Australia. ‘Part of the fun of Christmas and the holiday season is catching up with family and friends and helping out by sharing dishes at celebratory events. But transporting riskier foods can be dangerous especially at this time of the year when several generations get together. Young children, the elderly, those with compromised immune systems and pregnant women can be severely affected by food poisoning,’ Dr Eyles said. ‘Some simple planning can protect your family and friends, so talk to them early to work out who will prepare what food. Arrange to cook the riskier foods like meat and turkey on site where the Christmas dinner is going to be and use a meat thermometer to make sure it is cooked to 75°C in the thickest part of the meat. ‘Ask guests who are travelling for more than an hour to bring safer foods that don’t need refrigeration or keeping hot, such as cakes, biscuits and Christmas puddings. If they like to cook they can always come earlier and help you in your kitchen. Make sure your kitchen and utensils are clean and that everyone washes and dries their hands before handling food. ‘Those that live less than an hour away could bring hot food in an insulated bag but make sure it is reheated to 75°C before serving. ‘Those living less than an hour away could also bring refrigerated items like salads and desserts. Refrigerated items should be packed in a cooler or esky straight from the fridge and just before leaving the house. Surround the food with ice bricks, frozen gel packs or frozen drinks. If you are having a BBQ any raw meat or poultry should be packed at the bottom of the cooler in an enclosed plastic container where it can’t drip onto other foods,” Dr Eyles concludes. Talk to friends and family to work out who brings what. Arrange to prepare and cook riskier foods like meat, seafood, turkey and fresh dairy or egg based deserts on site Those travelling long distances could bring less risky foods such as cakes, biscuits and Christmas puddings. Turkey lovers be smart: Turkeys can be big birds and a big problem if you don’t have a plan, so before buying a huge frozen turkey, read the label! Big turkeys take several days to defrost in the fridge, not to mention hours to cook properly, so think whether you really need one a whole, big one. Ask yourself what else are you serving and consider a part turkey, such as a breast, or turkey roll − much easier to defrost and cook to perfection. If you still opt for the whole turkey and cannot source a fresh bird ask your butcher or supplier to defrost the turkey in their cool room so you can pick it up in time for Christmas and refrigerate. Whether full turkey or turkey roll, this meat must be cooked all the way through so use a meat thermometer to check that the temperature in the thickest part reaches 75°C. Because stuffing slows down cooking and cooling, it is best cooked separately. Ham it up at Christmas and beyond: Your Christmas ham will keep several weeks with proper handling. After reading the packaging labels, remove it from its plastic wrap, cover it with clean cloth soaked in water and vinegar so it doesn’t dry out, and store it in the fridge below 5°C. Reduced salt hams are now becoming popular but will not last as long as conventional hams so think how much you are going to use in the next week or so and freeze some for later. 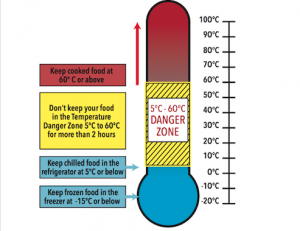 Temperature danger zone: Food poisoning bacteria can grow rapidly between 5°C and 60°C, so keep hot food hot, and cold food cold – including when transporting food. Use insulated containers or eskys and stack with plenty of ice bricks, frozen gel packs or frozen drinks. Drinks on ice rather than cramming the fridge: Drinks are actually “ice cold” if put on ice! A leak proof container is all that’s needed. Outside is best as it keeps the crowd outdoors ensuring the fridge will have a chance at running at 5°C or below, and that the cook can work in peace. Refrigerate leftovers immediately after the meal. 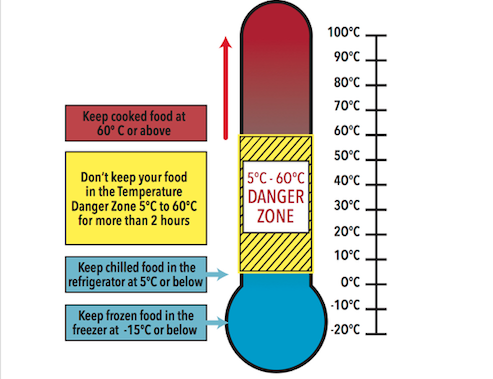 If leftovers have been in the temperature danger zone for more than 2 hours they should be eaten or refrigerated immediately and for more than 4 hours they must be thrown out. Always store perishable leftovers in the fridge and use them up within two to three days. When reheating food ensure that it is hot all the way through (use a thermometer to ensure it is at least 75°C in the centre). Check out our holiday season fact sheet.